lessons…and that is saying a lot. actually do something about it. sugar, vanilla bean and seeds, and salt. Cook over medium heat until this comes to a simmer. remaining 1/4 cup sugar until homogenous. instant read thermometer –I didn’t have one). Remove from the heat and remove the vanilla bean from the mixture. to prevent a skin from forming. – Make your pâte à choux. from the sides and a film forms on the bottom of the pan, about 3 minutes. egg white, a little at a time, until a soft peak forms. parchment over before piping on the batter) but I didn’t – you may want to though, seeing as how my éclairs came out a tad crooked. have to do it in batches like I did. pastries to a wire rack to cool completely. down the sides of the éclairs. into the hole you’ve made in the pastry shell and pipe to fill it. Repeat with the other pastry shells. – I didn’t have a small pastry tip so I sliced the shells open and filled them that way. Not the tidiest thing but in a pinch it does the job. time for the glaze to set. the same so I used the regular Tahitian. open to all readers in the Philippines and beyond. I wanted to eat it out of a bowl with a spoon, like a comforting as English custard. 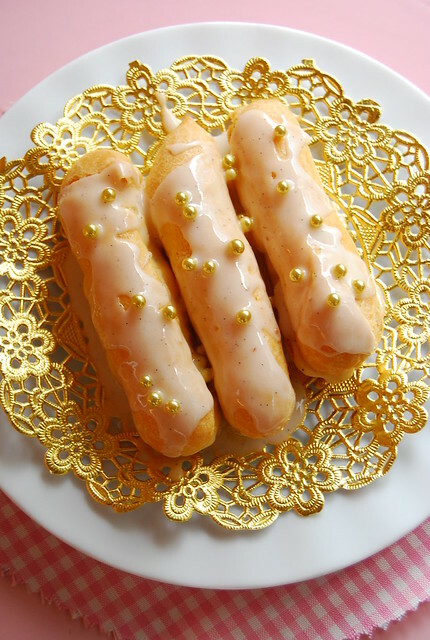 Gorgeous éclairs and wonderful giveaway! O ha.. I can relate to the heavy handed and – for me- clumsiness. I was never a pretty dainty little girl. I was more of run with the boys type… Lol. Still to this day the fragile and elegant things in life are somehow never meant for me but eclairs such as yours I think I could maybe manage! They look lovely and I totally love vanilla beans! They're expensive here and we onc bought a huge batch when we were in Madagascar as they're so much more affordable there. I still use some of those today! I agree with embracing what we have and dealing with the cards we've been dealt with. For example, I have long, wide feet and have long since given up on ever finding a pair of heels big enough and cleverly made enough for my humongous feet to fit into. The bright side though, is I have a rock solid excuse to always wear flats and sneakers in comfort. I love this twist on an Eclair – they look beautiful! Great take on evlairs. Can't wait to try them. I have never used vanilla beans in baking only with making homemade vanilla. Those looks amazing by the way! I want to try this vanilla! These éclairs look tasty! Absolutely beautiful! I have never tried one without chocolate on top but you have inspired me to try to make these (I haven't had the courage before even though they are my favs)! the photo makes me drool! wonderful giveaway! Oh my goodness!!! Your eclairs still look luscious! I've never, ever seen or held, or smelled the real thing! And I love thick and rich vanilla custards and vanilla-flavored or vanilla-scented anything! These sound so lovely! I would love to try the vanilla!! Hi Simone! Dainty was never a word you could use to describe me either! I can never seem to get the hang of light and fluffy desserts! Wow, Madagascar! Thank you Betsy! So true that about practice! Hi sweetmnemonic! I can just imagine! Hi Baking Biologist! Although eclairs take a bit of steps to make, it is actually not that difficult 🙂 Hope you give these a try! Hi Meredith M! Thank you! Hi Mom Friday! The vanilla beans really do give a flavor that regular extracts can't match…I also love the scent of vanilla on anything! I would be more than delighted to receive a Vanilla Bean for the simple reason that I have not, yes, I HAVE NOT SEEN one. Hi Edik! They are wonderful to bake with! I took a decade of ballet and all i got in return would be strangely straight posture and veins :} those eclairs look lovely! OMG, we are alike! I hated ballet class as well! Which I totally don't "get" since I like to dance now (and back then). Maybe I just didn't like the structure or the commitment or the discipline??? Now, I wish I had pursued that – hahaha. The other thing I didn't like also – piano lessons. Unfortunately, I studied for at least 10 years. And what do I have to show for now? Nothing. But back to your eclairs. They are simply stunning! Coincidentally, they look like a ballerina's tiara or tutu 🙂 Freudian baking, you think? They look gorgeous, you seem to have got a very very good bake on your eclairs. I personally prefer a thicker icing, but to each their own. Your recipe is beautifully written so I will have to try it out! my father asked me tonight why i am very happy. the reason is that now i know where to buy those vanilla beans. Wow, those are pretty eclairs! Im envious, Im going to try making them again. Last time, I just made round pate choux and filled them with pastry cream. Ballet was not for me either. My ballet teacher actually told my mom so. Hahaha. I had better luck in tap dance but not much. I guess I'm just nor wired out to dance. Your eclairs look dainty yummy. I love eclair and vanilla…combined together…Heaven! Vanilla beans are awesome – they make baked goods worth the work! Thanks for sharing! I will try this recipe for round puffs! So i can put in more cream per piece! Hi Jen! I actually love to dance too, despite my not-too-great experience with ballet 🙂 Yes, Freudian baking I think…still trying to force myself to be dainty! Hi Midge! Lucky you! Hope you like the eclairs! Hi Jochebed! Glad to be of service! Hi Ikkinlala! The vanilla beans really make a difference! Hi Michael Angelo! Coincidence indeed! Hi LBB! Yes, I'm a believer now! I'm new to your site–and I'm impressed. Love using Vanilla Beans–nothing better tasting than that!